It’s been a long time comin’! A long time since we’ve been rocked by a new male R & B group. Back in the ‘90s, Boyz II Men thrilled and surprised us all with their preppy costumes and hype dance moves. Then Jodeci stepped on the scene to serenade us with their sultry baby-makin-hits. Now Midwest City from Midwest City, Oklahoma is ready to do their thing. Talented enough to sing a cappella, energetic enough to move the crowd – these humble, yet confident young men know how to bring it! And you won’t be disappointed. MVRemix: When I first heard “One Love” I immediately thought of Jodeci and Silkk. How does that make you feel? Do you like being compared to other great artists, or would you prefer that people say you have an original sound? Midwest City: [cheering] Yeah! Yeah! Jodeci was one of the groups who really inspired us. So, it’s definitely an honor to be compared to them. We love that! MVRemix: Where did you guys meet. And whose idea was it to form a band? Shay: Well, Shamel and I are brothers. And the other members are our cousins. So we’re all family. Solomon: We didn’t really form a band per se. We would always just get together, you know, and sing together, and we came together that way. It just happened. MVRemix: Do you write any of your own songs? If so, tell me about the writing process. MVRemix: So you use a lot of material from your own lives, huh? MVRemix: Your song “One Love” has an underlying tone of respect for relationships and respect for women. Can we expect you guys to continue with this genre, or are you not opposed to the “I got all the hoes” type of stuff. Midwest City: [The group erupts into laughter before replying] Um…well…We just want the world to know that we are not perfect dudes. We do have a lot of respect for women but we’re not perfect. MVRemix: There’s also a religious aspect to “One Love” where you talk about God and prayer. How does religion or spirituality play a role in who you are and what you hope to become? Shamel: Well, we’re from Oklahoma; and it ain’t nothin’ to do here but go to church. So, we were all raised in the church. But it feels good to be able to have church people and older people listen to our song and actually like it because we sing about things that don’t offend them. MVRemix: I visited your MySpace and your website and was disappointed that I wasn’t able to see a picture of you guys. Are you deliberately keeping your identities concealed? If so, please tell us why? Tone: It’s funny that you ask that because that’s kinda been a joke around here. People have been calling us “Silhouette” because no one’s seen photos of us. Nah, we didn’t do it on purpose. It’s just that we’re a new group and we just got photos and stuff done. So, everybody’ll be able to see ‘em soon. MVRemix: This question is for each of you. If there was one thing you wanted your fans to know about you, what would it be and why? For example, people might look at male R&B artists and assume that they’re raunchy or lascivious. So, what truths do you want to make known about yourselves? Solomon: I want people to know that I’m not stuck up. I love to talk to people. I mean, hey, if you see us out someone and you want to talk to me, I would love to talk to you. Shay: [In a low and mellow baritone] I want people to know I’m laid back. I like to just kick it. Shamel: That I’m approachable and easy to get along with. I’m just like everybody else. I’m not untouchable. Tone: Well, I’m not as laid back as everybody else, but…we just want everybody to know that we love meeting people. 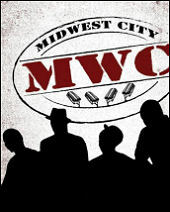 Midwest City: Yeah we love meeting people and we ain’t stuck up or nothin’ like that. We love and appreciate our fans. MVRemix: Tell me about any kind of musical or instrumental training you guys have had. Midwest City: Training? We all play a few instruments here and there but we just play by ear. We’ve been singing ever since we were little. MVRemix: Breaking into the music industry is no easy feat. You have to pay your dues before you can get signed to a major record label like you guys have. I’m interested in hearing about your most memorable “starving artist” gig – like doing a concert for no pay or singing in a 100 degree club with no air conditioning – before you got signed. Midwest City: Aww shoot! We’ve got a lot of stories like that. Shamel: Another time, we did this show in Sacramento and it was just all messed up! There was no set up – no speakers or nothin’. There was liquor all over the floor. We couldn’t even dance. It was crazy. MVRemix: Is anyone in the group married? And how do you deal with women throwing themselves at you? Midwest City: [After a long pause of stutters and laughs] Well, we don’t have any comment about that. We’ll let ya’ll find that out for yourselves. MVRemix: Any closing thoughts you want to leave with us? Midwest City: Yeah! We love ya’ll! And request “One Love” on your radio! "It’s funny that you ask that because that’s kinda been a joke around here. People have been calling us “Silhouette” because no one’s seen photos of us."